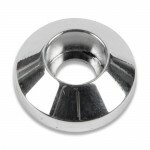 Machined to the same dimensions as our Lightning washers, these plain billet aluminum socket cap washers have a smooth outer edge. They are recessed to accept a socket cap screw (sold separately). All..